The presence of American ships in the slave trade increased significantly in the mid-nineteenth century. Not only did the American flag protected slavers from being intercepted by British naval ships, but several slavers from Portugal, Brazil, and other countries imported and used ships built in the United States in their activities. 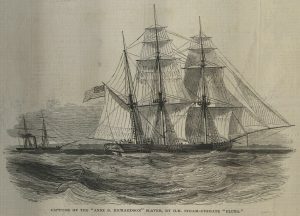 The image shows H.M.S. Pluto capturing the Anne Richardson, a ship flying American colors, off the coast of Africa.